Do you fantasize about working and studying outside? At Indiana Dunes National Park, you can meet a field biologist and his students who muck about counting frogs and salamanders and get paid to do it. On Saturday, April 20, from 10:30-12:30, celebrate amphibians with St Joseph's college graduates who were part of long-term studies on frogs and salamanders. Dr. Bob and his former students will talk about what the work is really like; their experiences doing it, and how it affected them. 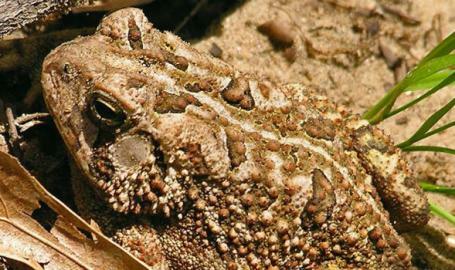 An added bonus, you can: observe and help feed the green frogs, bullfrog, and toad that live at the The Paul H Douglas Center for Environmental Education; bring a bag lunch and talk with Dr. Bob Brodman about his studies; and get a temporary tattoo for the one-of-a-kind Fowler's toad living in the dunes. The Douglas Center welcomes adults, youth, and families of all backgrounds. The center is open and always free every day from 9 a.m.-4 p.m. with an accessible wetland boardwalk. The center is located in the western portion of the national park at 100 North Lake Street, about one mile north of U.S. Highway 12 in the Miller section of Gary. For more information on this or other programs at Indiana Dunes National Park, call 219-395-1821 or check the park’s website at www.nps.gov/indu. The Indiana Dunes National Park is one of 419 units of the National Park System ranging from Yellowstone to the Statue of Liberty. Indiana Dunes National Park includes 15 miles of the southern shoreline of Lake Michigan and 15,000 acres of beach, woods, marshes, and prairie in the northwest corner of Indiana. More than 2 million visitors come to this national park each year. This event is co-sponsored by the iSWOOP project, which makes the science behind the scenes at national parks part of the visitor experience. You can read more at iswoopparks.com.